The Bucas Buzz-Off classic is made of ultra-fine-grained polyester that protects against the smallest insects and gives extra protection against UV radiation. This blanket is suitable if the neck of the horse does not need to be covered. 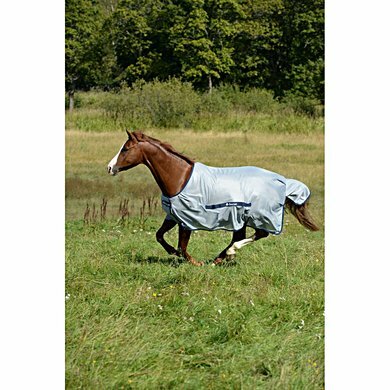 The blanket is provided with an elastic and removable belly flap that ensures that the blanket stays in place and optimally protects the abdomen against insects and flies. The blanket has shoulder folds for extra freedom of movement, the silk-feel lining at the shoulders prevents chafing and the tail flap protects the tail. There are attachment points for leg straps (not included). At the blanket a Buzz-Off fly mask can be bought which can be used for optimal protection of the head, this mask can be attached with elastic. 77% would buy this product again. My Walkach has partially spent 24 hours in the herd. He does not handle his blankets very nicely. The ceiling has endured and I can continue using it. Unfortunately, he has injured properly by the rear metal hook of the abdominal bib. I exchanged the abdominal bib for the abdominal straps of Bucas. That was just the case with my slender gelding. After that, there were no more injuries and the blanket still lay correctly. Am very satisfied with the blanket. Fits super! In very hot weather something t warm to have. 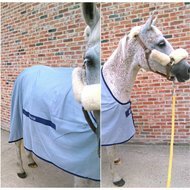 After shaving in the summer this blanket purchased because of the UV protection (have a white horse with pink skin) and has worked super! Nice blanket for my fjord. Almost all blankets slide and this is great. 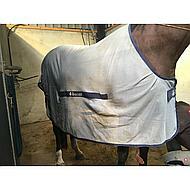 Answer: For an indication of the correct size, please refer to the link below; https://www.agradi.nl/maattabel-paardendekens/ For a horse with a height at the withers it will be about blanket size 140/190, Pay attention! a withers height is less decisive for an indication than the other values. We advise to always measure the back length and the lower length of the horse, as described via the link. Bucas has a fitting fit, possibly a larger size will be needed, depending on the construction of the horse. Question: Is it possible to order / confirm a loose neck with this blanket? 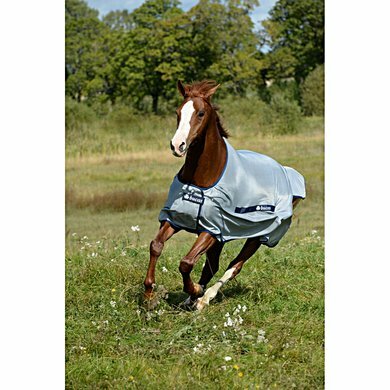 Answer: As indicated in the specifications, it is not possible to attach a loose neck to the blanket, the blanket also does not have a horseware linersystem. Question: is this blanket with belly flap included? Answer: A loose belly flap is included with this blanket.